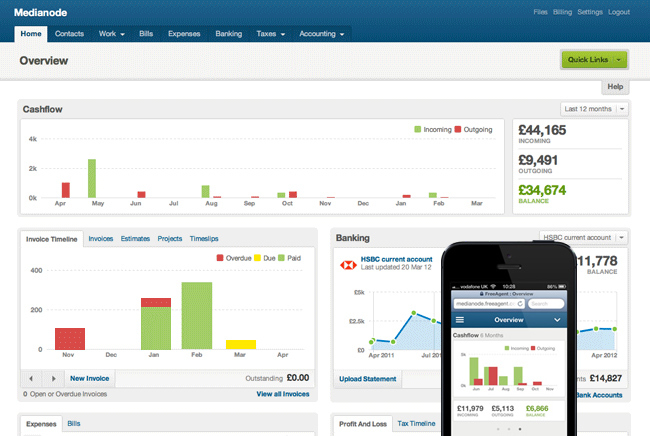 FreeAgent is the perfect online software for Contractors/Freelancers or small limited companies. Whether you operate as a sole trader, partnership or a limited company, FreeAgent can save you hours of time when compared to Sage or Excel. FreeAgent is very user friendly and easy to navigate and learn. If you are about to start a new business or looking for a new accountant, we strongly recommend you visit www.freeagent.com to see how there software can help make your life easier. Our Accountants at Nimbus Accounting have been working with FreeAgent for years and can offer you expert advise and guidance. We can help set you up on FreeAgent, give you training and provide you with on going support when you sign up for one of our fixed monthly accounting packages. If you can use a mouse, then you are already half way there. You do not need any accounting knowledge to learn the basics. With bank level security, hosted on rack-space, you know that your data is well protected. Not even FreeAgent can access your data without permission. FreeAgent reminds you of important dates including when your tax is due. It can also export these dates to your calendar. FreeAgent enables you to produce professional invoices which can be sent straight to your clients by email from FreeAgent in a pdf format. What else can FreeAgent do? FreeAgent is by far the market leader when is come to online accounting software for small businesses or contractors/freelancers. FreeAgent enables Nimbus Accounting to access your information, keep an eye on things to make sure cashflow is good and spot any tax saving opportunities. With the information in FreeAgent, if you are a monthly paying customer, we can discuss in real time your financial position and help with forward planning.